As Monterey Car Week began its annual social media takeover, for me, several predominant themes emerged. There was no shortage of stunning supercars skirting the Pacific Coast on famed roads like Highway 1 and 17 Mile Drive. The ornate streets of Carmel showcased some of the finest works of automotive art ever produced. And as is tradition for Monterey, incredible historic race cars were turning laps at the legendary Mazda Raceway Laguna Seca. However, something about the photos out of Laguna Seca caught my attention, and it was not the usual vintage cars that make all the big photo galleries. This was not because I disliked the cars people were photographing. Wide-bodied BMW CSLs are timelessly beautiful cars that manage to look elegant yet purposefully ferocious all at once. Car enthusiasts universally enjoy the sight of a Porsche 935 or 962 arcing towards an apex, flames spewing from hot exhausts as BBS turbofans fight to cool massive brakes. And despite Los Angeles’ best efforts, I will never tire of seeing a Ferrari (especially a vintage example) negotiating the famed corkscrew. No, there was nothing wrong with the subjects of the Laguna Seca photos—they were brilliant. What grabbed my attention, though, was the cars behind the Porsches and the Ferraris, just out of range of many a photographer’s chosen aperture. These blurry, cropped-out cars seemed to be fighting for deserved attention from the trackside lenses. I quickly recognized they were a completely different beast: pieces of 1980s American iron. A search for the Rolex Monterey Motorsports Reunion entry list confirmed my suspicions. Group 7B consisted of a delightful assortment of cars from 1982 to 1991 that hailed from classes and series such as IMSA GTO, SCCA Trans Am and GT-1. 7B skewed towards American cars, but had perfect international challengers such as the BMW M3 and Mazda RX-7. People often struggle with choosing what to do during the impossibly busy Car Week, where attending one world class event means missing out on several others. However, I knew exactly what I wanted to see. 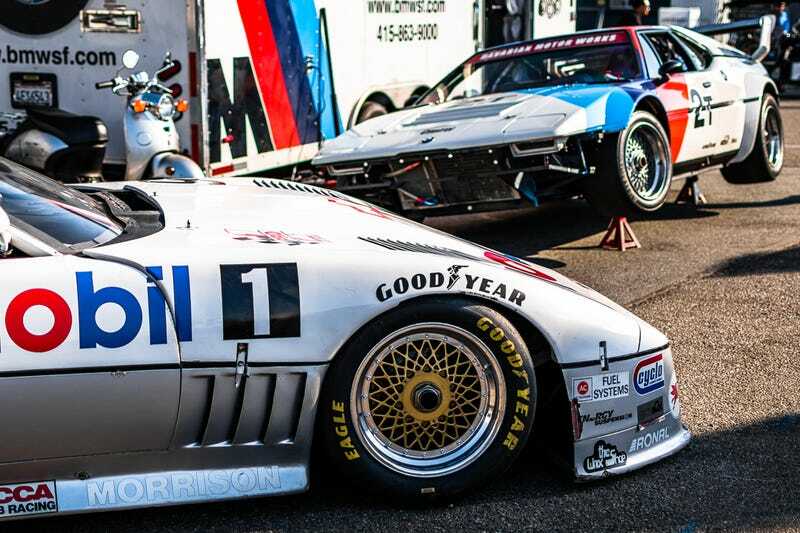 It was time to forget about all the other events, go to the track, and meet some ’80s and ’90s motorsports heroes. Upon arrival at Laguna Seca, I was greeted by a sign of things to come. Group 4B rumbled onto the track, consisting of an impressive array of 60s muscle punctuated by tasteful European sports-turned-race cars. Group 4B struggled mightily with oversteer; Mustangs slid their tails on exit, Corvette Stingrays seemed to go faster the sloppier they ran, and half-exposed Shelby Cobra drivers sawed at wooden steering wheels. For the spectators, the rarity of the metal at speed fostered excitement while the lack of driver protection fueled anxiety. Reprieve came from Europe. A Jaguar E-Type flowed out of the corkscrew, exhibiting grace and proper control. But it still brought drama thanks to its elegant shape juxtaposed against an explosive artillery cannon exhaust. Continuing this brief theme of control was a beautiful Ferrari 365 GTB that handily separated itself from the pack; it was unflappable, poised, and proud. But these moments were soon proven outliers. A Shelby GT350 brought the fireworks back with an overly aggressive entry into turn 8. A brief off-course excursion and a narrow miss of the inside wall reminded onlookers to the dangers of vintage motorsports. But there was no time for reflection as a 911 and Corvette rushed into the dust cloud, continuing the adrenaline-pumping spectacle. The musclebound American racers of the 60s bequeathed some of their DNA to Group 7B, but 7B was its own animal. These cars were far more removed from their street counterparts, requiring larger budgets and team support to run in their heyday. But despite tube chassis construction and limited parts commonality with regular production variants, each car’s identity was unmistakable. The 1988 Protofab Chevrolet Corvette had classic ‘Vette proportions exaggerated in just the right ways, looking longer, lower, and wider than its street variant. Yellow-letter tires and bespoke BBS wheels completed the transformation to ’80s track king. Roush Mercury Capris evoked similar themes, with their stubby front ends, rear fenders that swallowed impossibly large wheels, and surfboard spoilers. The 1982 SCCA Trans Am Championship winner, a Mecham Pontiac Firebird, resembled a high school student’s notebook drawing of a standard Firebird: stuffed wheel wells, an upsized wing, cowl induction, and a massaged nose stretched out for a more aggressive rake. Some cars were even more imaginative, such as the Oldsmobile Cutlasses spread throughout the paddock. They looked like a car that a bored racing enthusiast stuck in GM’s Oldsmobile division daydreamed to reality. Apparently the same thing happened at Buick, because a wide-bodied Somerset (later known as the Skylark) came out to play with its turbocharged V6. For an event that featured sensuously flowing designs from Aston Martin, Porsche, and Ferrari, the cars of 7B almost seemed gauche. But if the cars knew it, they didn’t care—and neither did I. These were race versions of the cars I read about in magazines, saw on TV, and spotted on the street before I was old enough to drive. They were a motorsports love letter to the automotive stars of the ’80s and ’90s, and they were about to hit the track. Group 7B had far greater control of its rear tires than the 60s muscle, but whatever drama was lost by the increased grip was immediately replaced by American Thunder. A hot pink Camaro Z28 seared eyes and deafened ears as it chased a red, white and blue Mustang GT. V8s rudely belched smoke on corner entry before violently transitioning to guttural roars on corner exit. As the eight-cylinder cacophony flooded the peaceful hills of Monterey, an ear-splitting scream pierced the wall of sound. A Mazda RX-7 was hunting, and it had Firebird in its sights. But the ‘birds held a numerical advantage, and the absurdly high-revving rotary was quickly washed away by a crescendo of V8 rumble. Meanwhile, an M3 opted out of the bravado and quietly picked off the unsuspecting in the braking zones. This high- and low-pitched audible fire and brimstone replayed lap after lap as cars jostled for position. Each car behaved like an extreme caricature of its stock counterpart. It was 1982-1991 street cars cranked to 11, and it was majestic. Amidst the fight on the track, a car I had missed in the paddock took me by surprise. The most beautiful Toyota Celica in the world was firing back at the V8s and rotaries with staccato pops, a midrange snarl from its 2.0-liter turbo motor, and the ability to grip anywhere on the track. The splendid Toyota livery added a touch of class and restraint to balance out the blazing orange Capri and hot pink Camaro, but its temperamental vocals and wide stance proved it belonged in 7B. It was so damn fast. So, too, was the 1991 Duracell Camaro. But for all its speed, the Camaro seemed to move slower as it passed by. The smell of race fuel and hot rubber filled the air. Yellow-letter Goodyear tires clawed the pavement for every bit of grip they could find. Chunks of rubber kicked out from under it as it carved a line across the gritty track. A large V8 gloriously hammered out the unmistakable song of torque. Its livery had chips, peels and scratches that told stories of victory and defeat. It was adding to that catalog today. This was the car from old magazine articles. It was the Hot Wheels toy hanging on the store wall. It was the fire-breathing motorsports version of my car, and it was magnificently devouring racetrack right before my eyes. This was the car I waited all week to witness. At that brief moment of full song in turn 8, it did not disappoint. And in almost the same instant, it was gone, its engine roar softly fading in the distance as the air it displaced gently flowed through the chain-link fence. Of course Monterey Car Week was a blast—it always is. But this was the must-see event, and it was because everything got celebrated here, even the weird stuff. And it’s all driven hard, the way it was meant to. What could be better? Kurt Klingensmith is an automotive photographer and writer. Got a story you’d like to submit to Jalopnik? Email us.